There are four points that conform the Path of Illumination and they represent the four elements of nature: earth, air, water and fire. These elements create a cross on the top of the map of Rome that needs to be followed to discover who is behind the bloody murder of several cardinals. If you want to save the Roman Catholic Church from the anti-scientism obscurantism and avoid the destruction of the Vatican, you can join Robert Langdom and Vittoria Vetra inquiries. If you hadn’t realized yet, this is the symbology of Dan Brown’s Bestseller “Angels and demons”. 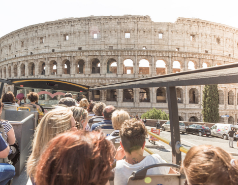 With the tourist bus of Roma City Tour you will be able to discover the main scenarios of the film and the novel. 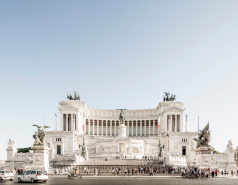 Start your tour in Pantheon, getting off at stop 5 of the routes Feriali and Festivi (Piazza Venezia), where the painter and architect Raffaello Sanzio is buried, and where the protagonists found out the first clue. Inside this monument, you will feel the majesty of the most ancient temple of Rome. Then, taking advantage of the hop-on hop-off service, get on the tourist bus until you get to the next stop, the sixth (Città del Vaticano). From this stop you will be able to get to other places, where there are scenes as important as the chase of the murderer of the cardinals in Castel Sant’Angelo, or go to important monuments described into the book, like St. Peter’s Square or Sistine’ s Capel. To finish with the tour, get into the bus again, and get off at stop 9 (Barberini), from where you will be able to arrive to Santa Maria della Vittoria Church, the scene where, there is a gunfire between the murderer and the Vatican gendarmerie. In Rome, there are other scenarios from shots of the film that hadn’t been mentioned and you can visit. 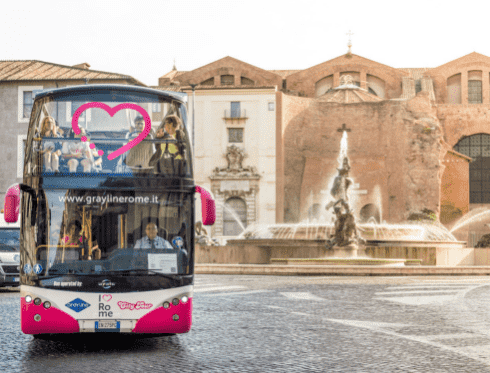 Organize the circuit at your pace, taking advantage of the panoramic bus Roma City Tour and, enjoy the city!